Many of our firm’s partners (pictured above) have spent the majority of their law careers at Brinker & Doyen, ensuring continuity and excellence in our work. Brinker & Doyen, L.L.P., was established as an insurance defense firm with roots that date back fifty years. Today we provide a full range of litigation and risk management services to insurance companies, third party administrators, and self-insured organizations and their personnel. Our firm represents clients in diverse industries from healthcare to trucking, and often works with public entities such as municipalities and other governmental entities. As a seasoned, medium-sized firm, we have the depth and experience to tackle our clients’ legal challenges while maintaining the highest standards of service. 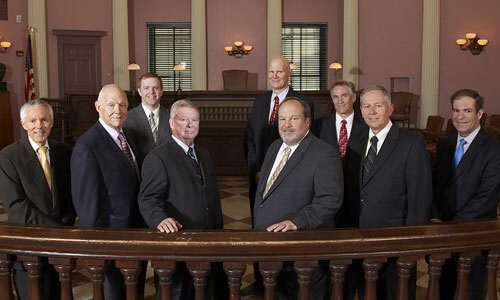 Brinker & Doyen, L.L.P., is unique in its attorneys’ loyalty and dedication to the firm. Many of our partners have spent the majority of their law careers in our practice, which ensures continuity and excellence in our work. We are proud of the rapport we build with our clients and the success we achieve for them. We are team-oriented and combine our expertise with an effective, pragmatic approach. We’re confident in our ability to take a case to trial, but are also skilled in crafting creative alternatives to the courtroom. We always work to find the best solution for our clients.